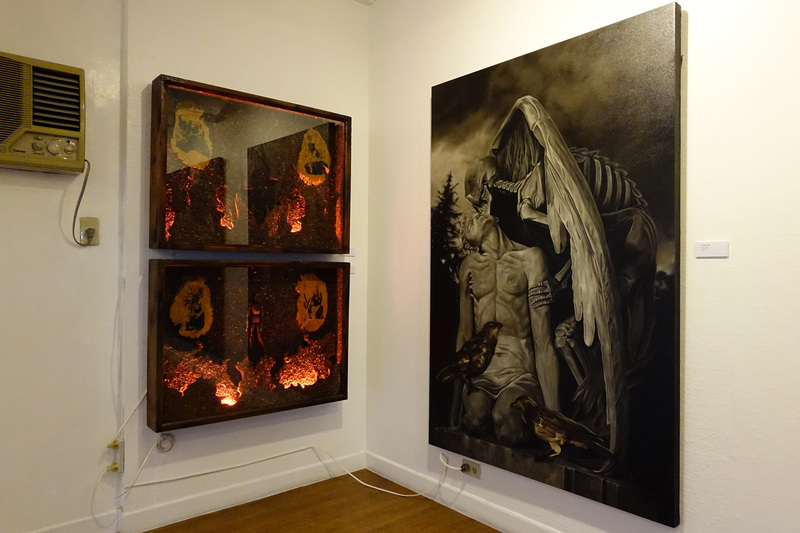 West Gallery presents Hamilton Sulit’s 3rd solo show, Walking Through Darkness, which continues the arcane narratives from his previous solo exhibition entitled Haunted. 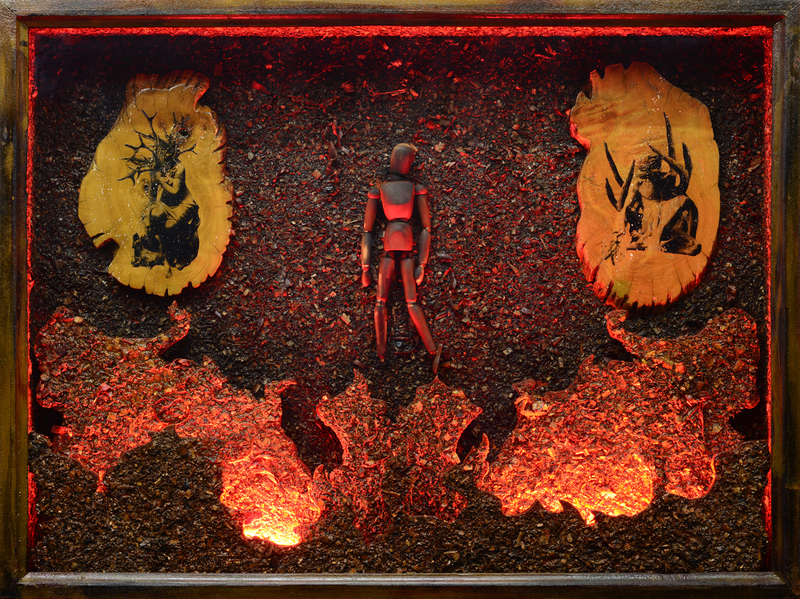 Sulit’s narratives, which double as the artist’s memoirs, are cloaked within the symbolic artifices of a desolate place—dark, remote, ravaged by crows. This is where the peripheral recollections of people and places and the interior psyche of symbolisms and dreams meet, tearing the canvas into layers of images, making way for the possibilities of meta-narratives. 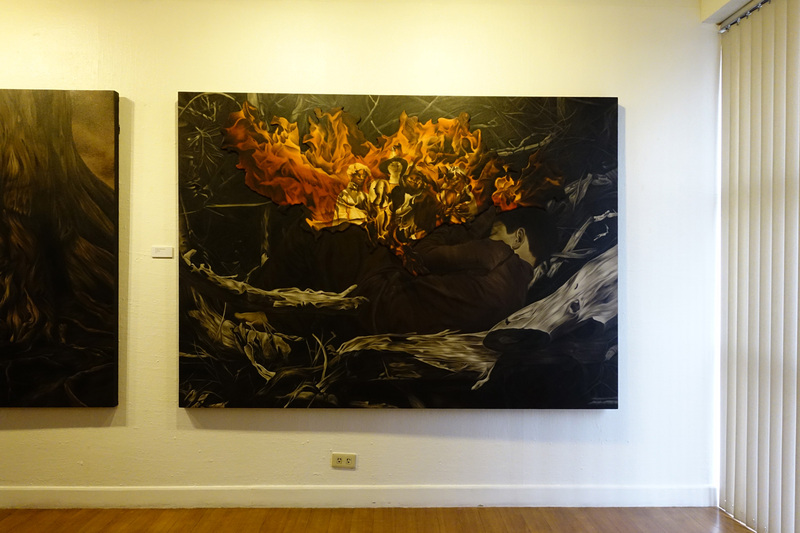 What ‘opens up’ within the frames of Sulit’s paintings are stories within stories. Using oil on canvas, Sulit paints with deep resolve in bringing detail to life. These details are aspects of his memories: people, places, rooms, and digging deeper within the psyche—imagery from dreams. The chasm between fantasy and real is depicted through the staging of a ‘tear’ in his pictures. The canvases bear juxtapositions of imageries as they go through a simulated gesture of ‘peeling’ in order to reveal an interior image. Through these blatant disclosure of images, the viewer is invited to ponder: that in every painted image, another story lies beneath. 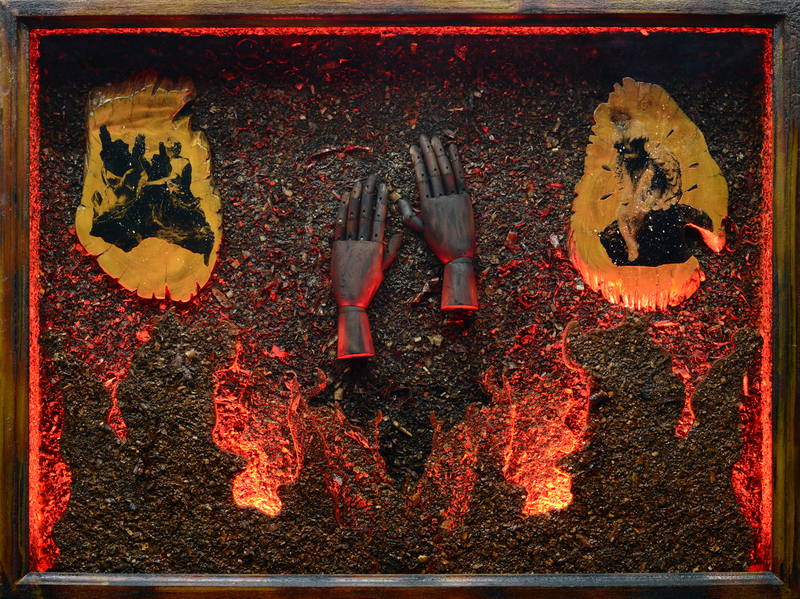 In a large diptych called, Tearing the Veil, a portrait of a woman opens up in the middle to reveal an amber-lit scene of a congregation of faces, while its other half, a languished parcel of wood, is equally riddled by flame-like intrusions. The dark and brooding quality of the background is juxtaposed with these bright-lit pieces of imagery. The contrast becomes wholly apparent. 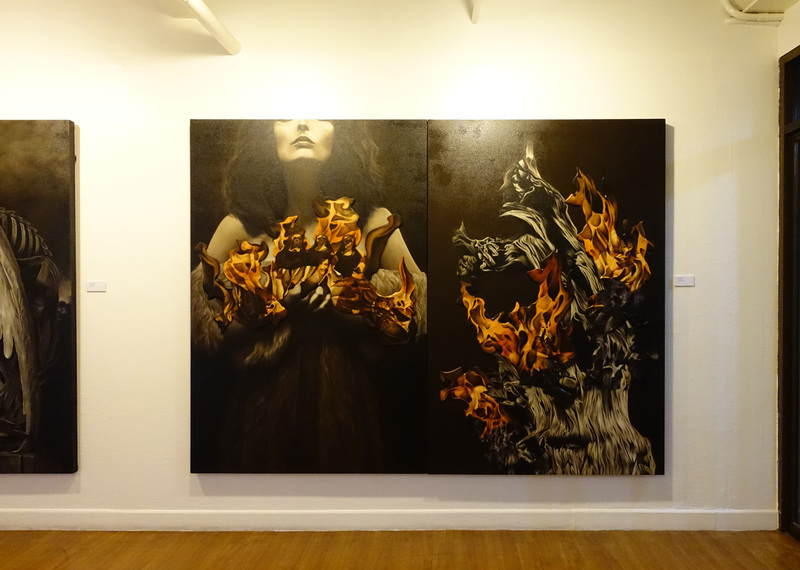 The pair of canvases appear to bear patches of burning flames. This form of interruption within the frame is continued with two other paintings, The Fall of Adam and Echoes of the Past. In both of these paintings, the image of the crow figures heavily as a motif. 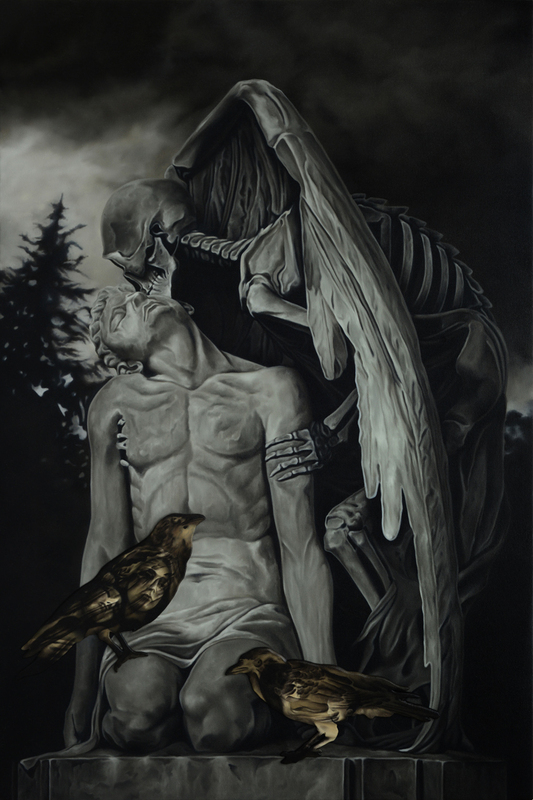 The crow is represented both as foreground and background—as a juxtaposed imagery and as an intrinsic part of the piece. 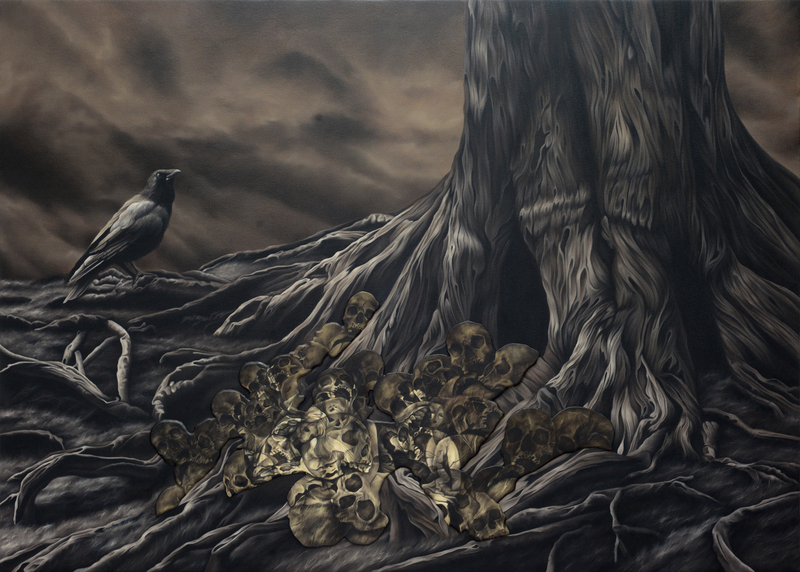 The symbols in these two paintings which Sulit chooses to use are both archaic and brooding with mystery. What appears to be a marble greek statue is placed alongside a deathly representation of a Renaissance angel—who, except for its wings, is stripped down to skull and bones. These sets of images place Sulit’s paintings within the realm of the gothic, which turns his narratives into mysterious confluences of memory and fear. 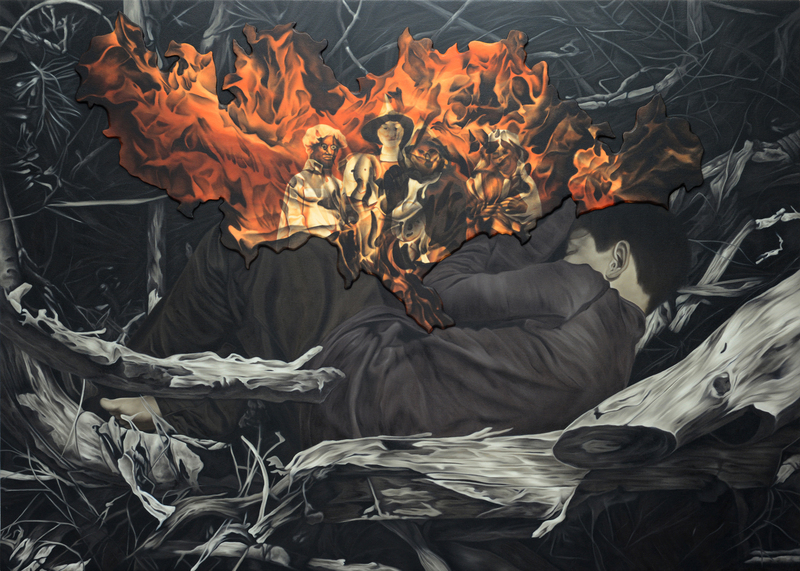 In one of his larger pieces called Death of Remembrance, we see a figure slumbering amongst a nest of branches and twigs. The middle of the frame, yet again, opens up—in flames, and is revealed through it a fictitious cast of characters, posed together to stare back at the dreamer. Is it a dream, this image that lies beneath? 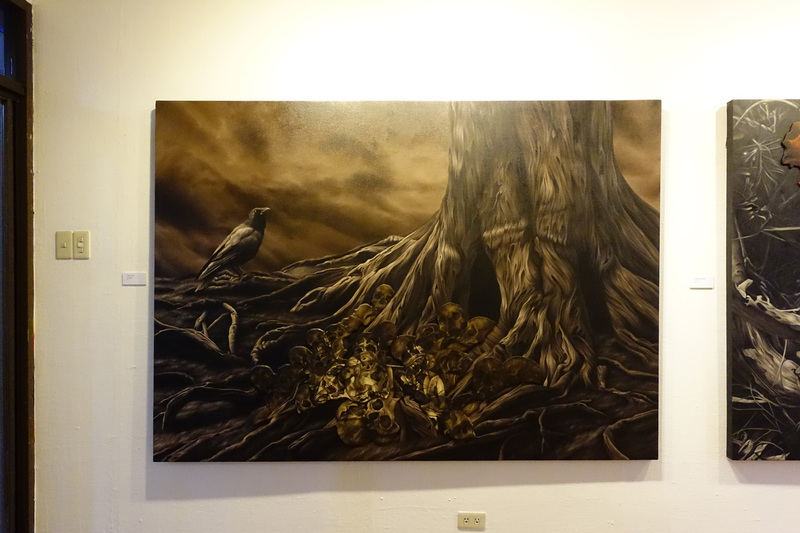 In Hamilton Sulit’s Walking Through Darkness, we cross the same chasm, and arrive at the multitude of layers that make up the artist’s narrative, the different layers of memory, fantasy, and reality.